Agitar Technologies enables the enterprise to release Java applications faster, reduce the cost of bugs, and more easily change both new and legacy applications to meet changing business needs. 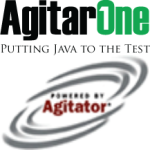 The “AgitarOne” product family enables software teams to create, use, and manage the extensive set of unit tests needed to be truly agile. Customers have cut legacy maintenance efforts by 50%, released new applications 30% faster with fewer bugs, and cut the cost of finding and fixing post-release bugs by 90%. Agitar Technologies is a privately-held company headquartered in Cranston, RI. For more information visit www.agitar.com.